It’s time to move blockchain related conversations away from the technical and into the business realm, with a new focus on use cases, implementations, solutions, lessons, and best practices. That doesn’t mean that we are done with technology developments. To the contrary, there is still plenty of work to be done at the blockchain infrastructure layers, pertaining to scalability, security, privacy, identities, and at the middleware layers where we need more mature and easy to use software tools and development environments. There are other conferences that are focused on discussing technology, and they are doing a great job at it. But we must shift the global conversations and start discussing business oriented topics. By doing so, we will be helping technologists who are the recipients of feedback, and it helps them continue their work. A month ago, I thought that we needed a new kind of industry conference, focused on the Business Blockchain. Since I didn’t see anything emerge, I decided to launch a new type of conference to fill this need, the Business Blockchain Conference, focused on exploring the exact frontier we are in when it comes to implementing cryptography-based blockchains, cryptocurrencies, distributed ledgers, and decentralized applications. The event will take place in downtown Toronto, April 19-20, 2016. I wanted to provide a reality check on the state of implementing blockchain related strategies, and bring all stakeholders that are in the trenches, together. Actually, many of these practitioners have been asking me to connect them together, because they want to meet and learn from each other. I made a few introductions, but then I asked them,- would you like to go to a conference where they would all be there? The answer was a resounding Yes. This conference will be tilting towards usages and implementations, and it will draw less from the vendors, but more from what customers are doing with their products. Vendors and technologies are important, but their stories are more valuable when customers are part of it, discussing what they are doing with their products and solutions. Mixing business people and technologists is the right thing to do, and that’s when the best ideas emerge. Truth is that no one has the whole picture, but if the smartest people are in the same room, then we will have the smartest conference, and we’ll get as close as possible to the full picture. Here’s the link to the conference site, including preliminary agenda topics and some speakers, but wait…there is more. There is a Call for Presentations, because we’d like to surface the best use cases from Europe, the US, Canada, Australia and Asia. I know they are there, and we would like them to come out, submit their stories, and present them. Of course, we are not asking anyone to divulge confidential projects information, but, for every case, there is a way to share lessons and best practices, without releasing private information. To help me curate the topics, and shape the conference, I’m proud to announce that Simon Taylor, VP of Blockchain Innovation at Barclays will be the conference co-chair, and I’m honored to be working with him. Simon is the quintessential blockchain in banking innovator, and his role is the envy of many others in the industry. We will be gradually disclosing speakers and sponsors to the program, and there will be some surprises. Each one of the program sessions will be in one of four streams: Financial Services, Government Services, Business Strategy, or Horizontal Applications. It’s time for deep dives into what the blockchain can offer. 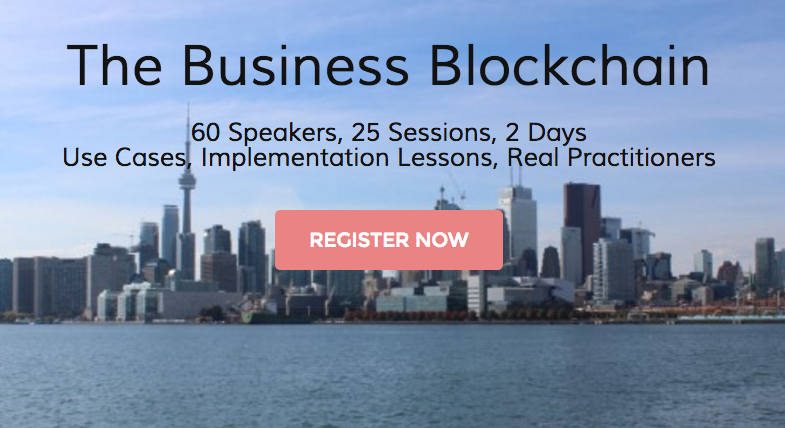 I am confident that the Business Blockchain Conference will deliver this experience. 2/ Purchasing an early bird ticket (only available to the first 100 or prior to February 3rd, and we’re waving the Eventbrite fee). 3/ Becoming a sponsor, if you are an enterprise or startup, and interested in gaining benefits from a sponsorship, please contact me directly at wmougayar@gmail.com. Please join me in celebrating our blockchain knowledge so we can learn together and advance the state of blockchain practices.